Semantics: introducing the term revision surgery in oral rehabilitation. Semantics is a term coined by Michel Bréal (1832 to 1915) a Jewish German-French linguist referring to the Greek semantikos (= meaning) in his 1897 book, "Essai de sémantique". He was a very gifted man: for example, he was the one who suggested to Pierre de Coubertin to include the marathon in the Olympic Games and who also, with the help of a Francophile American dental practitioner, Thomas William Evans, created the "Doctorat d'Université", finally allowing American students to pursue their doctorate at a French university. This review provides an overview of review and consensus articles of the past 5 years regarding surgical complications in implant dentistry. 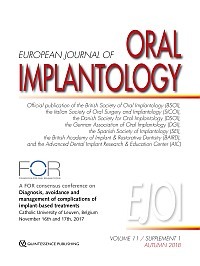 The focus in this article is on surgical complications occurring after implant insertion and on risk factors that compromise oral implant osseointegration. Goodacre, Brian J. / Goodacre, Sarah E. / Goodacre, Charles J. Aim: To present recent data regarding prosthetic complications with implant prostheses and crowns as well as compare this data with data presented in a 2003 publication. Material and methods: An electronic Medline (PubMed) with MeSH terms search was performed, focussing on clinical studies that reported data on prosthetic complications associated with implant fixed complete dentures, implant overdentures, implant fixed partial dentures, and implant single crowns. Results: There were nine prosthetic complications reported with implant fixed complete dentures, 17 with implant overdentures, four with implant fixed partial dentures, and six with implant single crowns. The greatest number of complications and the largest incidence of percentages occurred with implant overdentures. The lowest incidence percentages were recorded for implant single crowns. These findings are in agreement with the previous 2003 publication. It is of interest to note that some of the complications reported previously were not reported in this review, and some complications reported in this review were not listed in the 2003 publication, thereby limiting the number of direct comparisons between this paper and the earlier report. A surprising finding was that some complications associated with implant overdentures from the current data exceeded the incidence in 2003 (reactivation of the retentive attachment; mucosal hyperplasia; and the need for overdenture relines). Conclusions: Implant overdentures are associated with more complications than implant fixed complete dentures, implant fixed partial dentures, and implant single crowns. The lowest incidence of complications was reported with implant single crowns. The most common complication reported with implant fixed complete dentures was denture tooth fracture. The most common complication associated with implant overdentures was the need for adjustments. Porcelain veneer fracture/chipping was the most common complication identified in the studies of implant fixed partial dentures. The most common complication reported with implant single crowns was abutment screw loosening. Aim: To describe general observations of immunological reactions to foreign materials and to realize that CP titanium gives rise to a foreign body reaction with subsequent bone embedment when placed as oral implants. To analyse the possibility of titanium allergy. Materials and methods: The present paper is of a narrative review type. Hand and Medline searches were performed to evaluate marginal bone loss of oral implants and the potential of titanium allergy. Results: Immunological reactions to foreign substances include Type I hypersensitivity reactions such as allergy, Type II hypersensitivity reactions characterised by IgM or IgG antibodies that may react with blood group antigens at transfusion, and Type III hypersensitivity caused by antigen-antibody immune complexes exemplified by acute serum sickness. There is also Type IV hypersensitivity, or delayed hypersensitivity, which is typically found in drug and foreign body reactions. It proved very difficult to find a universally acceptable definition of reasons for marginal bone loss around oral implants, which lead to most varying figures of so-called peri-implantitis being 1% to 2% in some 10-year follow-up papers to between 28% and 56% of all placed implants in other papers. It was recognised that bone resorption to oral as well as orthopaedic implants may be due to immunological reactions. Today, osseointegration is seen as an immune-modulated inflammatory process where the immune system is locally either up- or downregulated. Titanium implant allergy is a rare condition, if it exists. The authors found only two papers presenting strong evidence of allergy to CP titanium, but with the lack of universally accepted and tested patch tests, the precise diagnosis is difficult. Conclusions: CP titanium acts as a foreign body when placed in live tissues. There may be immunological reasons behind marginal bone loss. Titanium allergy may exist in rare cases, but there is a lack of properly designed and analysed patch tests at present. Movement disorders encompass a wide range of medical conditions that demonstrate changes to muscle function and tone which present with orofacial dyskinesia and dystonia. The most common conditions exhibiting these features are Parkinson's disease, Down syndrome, chorea and epilepsy. Aim: To establish whether implant success in patients suffering from movement disorders is similar to the general population, identifying risk factors and noting recommendations that may aid maintenance programmes. Method: PubMed and Medline searches, combined with a manual search of the reference lists of identified full text studies. In total, 19 patient case reports and 11 patient case series were identified for inclusion in the review. Results: Implant survival in patients may be less than expected in patients with movement disorders, but evidence points to early rather than late failures. Oral hygiene control was widely reported as an issue, although there was insufficient evidence to imply that a lack of oral care will cause more rapid deterioration in implant patients with movement disorders. Maintenance requirements were low for fixed restorations, but more frequently reported in patients treated with overdentures, with the attachment mechanism and the prostheses requiring replacement. Chewing and quality of life in relation to prosthesis wear were improved. Conclusion: Provision of implant-supported prostheses improves chewing and quality of life for patients with movement disorders and should be considered as an option in the treatment planning for tooth loss in this group of patients. However, straightforward designs that lend themselves to easier long-term maintenance should be adopted. Aim: Nowadays, oral implants are a leading concept in oral rehabilitation. Patient satisfaction with this treatment is high, but are the expectations of the patients met? The aim of this review was to systematically screen the literature on patients' expectations of implant-based therapy before treatment and to assess whether these expectations were being met. Materials and methods: A search strategy was developed for manuscripts dealing with patients' expectations of implant-based therapy to support different types of prosthodontics. Patients had an indication for implants, were seeking implants or had received implants. PubMed/MEDLINE, Ovid/EMBASE and Cochrane/CENTRAL were searched to identify eligible studies. Two reviewers independently assessed the articles. Results: In total, 16 out of 3312 studies assessing patients' expectations of patients before implant-based therapy matched the inclusion criteria. A variety of methods were used in the studies. Patients had high expectations, with function followed by aesthetics being the most important expected improvements. Women had higher expectations than men. Costs were a major factor against implant-based therapy. The expectations that implants will last a lifetime and require no special needs of oral hygiene were of concern. Conclusion: Prior to treatment, patients have high expectations of implant therapy. In general, these expectations are met. Most studies revealed that women have higher expectations than men. The variety of applied study designs impaired comparability of results. Thus, standardised methods for measuring expectations of implant-based therapy are eagerly needed. Aim: The objective of this systematic review was to evaluate the diagnostic value of CBCT compared with 2D imaging and clinical gold standard techniques in peri-implant bone defect detection and measurement. Materials and methods: Literature search was performed using MEDLINE, Embase and Web of Science databases up to July 2017. Clinical, ex vivo, in vitro and animal studies that assessed and measured peri-implant bone defects using different imaging modalities were included in this review. Two reviewers performed data extraction and qualitative analysis. The methodological quality of each study was reviewed using the QUADAS-2 tool. Results: The initial search revealed 2849 unique papers. Full-text analysis was performed on 60 articles. For the present review, nine studies were considered eligible to be included for qualitative analysis. CBCT performed similar to intraoral radiography in mesiodistal defect detection and measurements. Additional buccolingual visualisation and volumetric and morphological assessment of peri-implant bone defects are major advantages of 3D visualisation with CBCT. Nevertheless, one must be aware of metal artefacts masking osseointegration, shallow bony defects and other peri-implant radiolucencies, thus impeding early diagnosis of intrabony lesions. Conclusions: The present review did not provide evidence to support the use of CBCT as standard postoperative procedure to evaluate peri-implant bone. Up to date, we are clinically forced to remain with intraoral radiography, notwithstanding the inherent limitations related to restricted field of view and two-dimensional overlap. A 3D imaging approach for postoperative implant evaluation is crucial, making further development of an optimised and artefact-free CBCT protocol indispensable. Aim: In this systematic review, we aimed to assess the impact of endosseous implants on the formation of an osteonecrosis of the jaw, as well as implant survival rates for patients under bisphosphonate (BP), antiresorptive and radiation therapy. Materials and methods: An electronic search was performed using PubMed, Embase, and Medline databases with the logical operators: "dental implant", "antiresorptive", "bisphosphonate", "irradiation", "radiotherapy", "radiation", "necrosis" and "survival". The search was limited to articles published up to 15 December 2016. Recent publications were also searched manually to find any relevant studies that might have been missed using the search criteria noted above. The outcome variables were the implant survival rate and the frequency of osteonecrosis of the jaws. Results: In total, 18 studies addressing oral implants in patients with BP or antiresorptive therapy and 23 with radiation therapy met the inclusion criteria and were included in this systematic review. Most of the studies had a retrospective design with a level of evidence (LoE) of III (moderately high risk of bias). Implant survival rate ranged from 92.86% to 100% in patients with BP/antiresorptive therapy (all due to osteoporosis) and 38.5% to 97.9% in patients with radiation therapy. For BP patients, osteonecrosis in relation to oral implants more frequently occurred in patients taking BPs due to malignant diseases. In patients with radiation therapy, an "implant triggered" necrosis is also a potential complication. The lack of data in the current literature concerning this issue does not allow a proper risk assessment to date. Conclusions: Within the limits of this systematic review, implant treatment concepts seem to be a valuable approach in patients with radiation therapy and patients with BP therapy due to an osteoporosis. In patients taking BPs due to a malignant disease, implant treatments are not recommended due to the high number of reported implant-related necrosis in this patient cohort. Outcomes of this review should, however, be regarded with caution due to the low level of evidence of the currently existing data. Veitz-Keenan, Analia / Ferraiolo, Debra M. / Keenan, James R.
Asepsis is described as a state free from microorganisms. In medicine, an aseptic environment is necessary and expected to avoid the spread of infection through contact between persons, sprays and splashes, inhalation, and sharps. Most dental procedures are performed in a "clean "environment with the common use of personal protective equipment (PPE) such as disposable gloves, masks and protective eyewear with disinfection of surfaces and sterilization of instruments. For surgical procedure such as the insertion of endosseous implants, the recommendations are not clear. The use of antimicrobials and antibiotics before and after the procedure remains a controversial issue The purpose of this literature review is to evaluate the current evidence as to what is generally expected and widely accepted in the use of aseptic techniques for the surgical placement of endosseous implants, and the impact on implant survival and overall success. The aim of the present systematic review was to evaluate reported survival rate and marginal bone (MBL) loss of implants with different surface roughness and followed up for 10 years or longer. For the majority of the 62 included clinical studies, no direct comparison between different surfaces was made, thus our report is mainly based on reported survival rates and marginal bone loss for individual implant brands with known surface roughness. The survival rate was 82.9 to 100% for all implants after 10 or more years in function and the marginal bone loss was, on average, less than 2.0 mm for all implant surfaces included, i.e. turned, titanium plasma sprayed (TPS), blasted, anodised, blasted and acid-etched but the turned surface in general demonstrated the smallest MBL. However, the survival rates were in general higher for moderately rough surfaces. The roughest TPS surface demonstrated the highest probability for failure, while the anodised showed the lowest probability. In conclusion, the present systematic review demonstrates that it is possible to achieve very good long-term results with all types of included surfaces. Aim: To review available evidence in scientific literature on oral implants of severely reduced length or diameter. Materials and methods: Electronic and hand searches up to May 2017 were performed in order to identify clinical investigations providing implant survival and/or marginal bone resorption data for extra-short implants < 7.0 mm in length and extra-narrow implants < 3.5 mm in diameter (excluding one-piece mini-implants). Results: A total of 2929 extra-short implants and 3048 extra-narrow diameter implants were investigated in 53 and 29 clinical studies, respectively. Shorter implants between 4.0 mm and 5.4 mm in length showed comparable results to implant lengths of 5.5 mm to 6.5 mm (95.1% vs. 96.4%, P = 0.121) and no difference regarding marginal bone resorption (0.7 mm vs 0.5 mm, P = 0.086). Implant lengths of 5.5 mm to 6.5 mm, however, performed significantly better in the mandible compared with the maxilla (P = 0.010). Smaller diameters between 3.0 mm and 3.25 mm yielded a significantly lower survival rate of 94.3% than wider implants of 3.3 mm to 3.4 mm diameter (97.7%, P < 0.001), while marginal bone resorption did not differ (0.4 mm vs 0.5 mm, P = 0.447). Conclusions: The results of the present literature review suggest that extra-short and extra-narrow-diameter implants show satisfactory survival rates of around 95% and little marginal bone resorption of around 0.5 mm after a mean follow-up of 3 years. However, implant lengths < 7 mm in the maxilla and < 5.5 mm in the mandible as well as diameters < 3.3 mm may increase early failure rates. Aim: A large variety of dental materials are available for the production of implant-supported fixed restorations. Materials with different properties are likely to behave differently during clinical function, which may result in different prevalence and types of complications. The aim of the present review was to summarise, analyse and discuss the prevalence and types of complications or failures related to dental materials in implant-supported restorations. Materials and methods: A strategy was set up using the PICO format and the search was performed using the PubMed database, including a hand search of reference lists. Two independent reviewers selected papers based on a set of criteria. The number of events of complications was summarised. Results: The initial search produced 2764 titles. After application of criteria, 47 publications were selected for analysis. Seventeen studies reported on 1447 single crowns and 30 studies reported on 2190 fixed dental prostheses. The most common complications were fracture or chipping of the veneer material, loss of retention and lost access hole fillings. Due to the heterogeneity of studies, and large variation in number of restorations per material group, no conclusive correlation between type of material and type of technical complication and/or failure could be established. Conclusions: The review did not succeed in providing convincing evidence to answer the question concerning a possible relationship between restoration materials and prevalence of technical complications in implant-supported restorations. Aim: In this review, we look at the factor of the surgical experience and surgical workload in a variety of surgical disciplines and its effect on the intraoperative and postoperative complications rate. Materials and methods: An extensive systematic electronic search was carried out on the relevant databases. Two independent reviewers were engaged in selecting appropriate articles in line with the protocol. Results: It was very interesting to see that only 52 studies could be identified as per the inclusion criteria and search keywords. This included studies from 1990 onwards, spanning all surgical disciplines. Six studies were identified in third molar surgery, one of the most common surgeries practiced across all surgical disciplines. Seven appropriate oral implant surgery studies were identified, covering two-stage implants and immediately loaded implants. The evidence was overwhelming that the surgeon's experience positively correlates with the level of osseointegration and implant success. An interesting study from general surgery highlighted the fact it is not unusual to see senior surgeons selected to operate on complex patients or carry out complex surgical procedures than their junior colleagues. In face, this may explain why a number of studies identified no difference in the surgical complications between seniors and juniors. Conclusions: Despite the fact that experience matters, many factors can influence the outcome of the surgery. If the surgeon, despite his/her lack of seniority, manages to utilise experience appropriately then there will be a beneficial outcome for the patient.